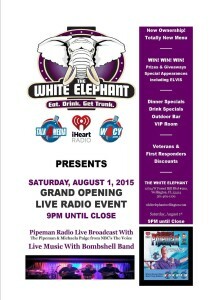 The White Elephant GRAND OPENING! NEW OWNERS! TOTALLY NEW MENU! Get Trunk with us! The Adventures of Pipeman Radio Show and W4CY Radio of Talk 4 Media partnered with ‪#‎iHeartRadio will be broadcasting live 8-10PM ET on Saturday, August 1, 2015 . Meet and Greet with PipemanRadio hosts ‪#‎ThePipeman & Michaela Paige Kaman from ‪#‎NBC ‪#‎TheVoice . Have fun, enjoy great food and drink PLUS WIN FREE PRIZES & GIVEAWAYS! Live Music with ‪#‎bombshellband. This is a night not to be missed! Drink Specials! Dinner Specials! Outdoor Bar! VIP Room! Veterans & First Responders Discounts!